Are you familiar with the "Canadian Tuxedo"? While often considered a mistake of the 90's (there is even a website dedicated to the worst offenders), denim-on-denim looks have lost the boy band stigma, and are once again fashionable! "Sometimes it’s important to look your best. Sometimes everything else is in the wash. Sometimes you just don’t need a reason. In these situations, it’s good to know there’s a fashionable option to ensure you feel comfortable as well as good looking. 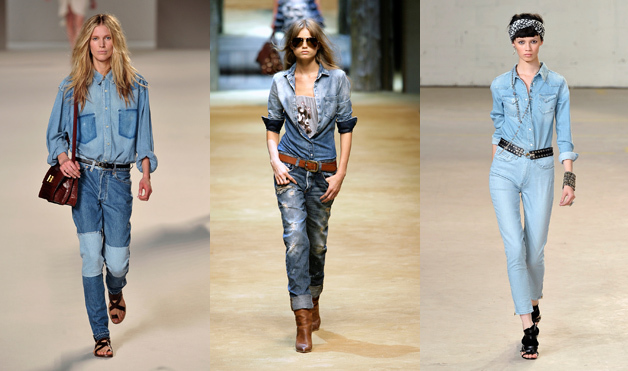 Couple your jeans with your denim jacket in a delicious double denim ensemble that tells the world just how super cool you are"
The runways and street-style sidewalks have embraced the head-to-toe denim esthetic (hello Spring 2010), have you? I was reluctant to give it a try (aka late to the party again), but now that I have embraced this lifestyle, I think I'm hooked (it doesn't hurt that my chambray shirt is easily my favorite shirt in my closet!) Good thing fashion is a little behind here in Nashville. I also am looking forward to pairing my chambray shirts with colored/patterned denim come spring - so fun! Love this whole outfit! I've been looking for a chambray shirt, and I like how you paired it with darker denim. And LOVE the necklace! Love this look! 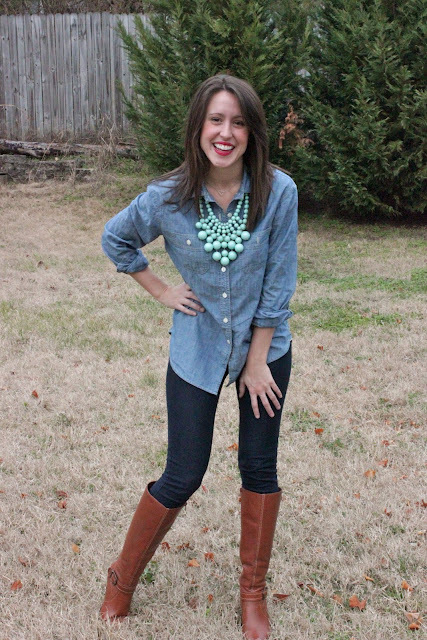 You can't go wrong with a classic chambray shirt and there's so many ways to style it! I love it! I'm thinking about doing an outfit like that myself. I think it's funny how 5 years ago it would have been a huge fashion faux pas haha. I love the look on you! You are adorable!! Love it...because you are wearing dark bottom with light top, not crazy about the same colors of denim. I love style. Simple as that! No matter what is in, what is out. I <3 ladies who wear what they want and love it. So naturally, I love your style!! I LOVE it! The necklace totally pops against the blue denims... So super cute on you! I am also reluctant about this, but I think the key is to keep the shades contrasting. I prefer the dark denim with the lighter top. You did a fabulous job. I also LOVE the necklace. I highly recommend this Chambray shirt from J.Crew! I have been living in it this fall/winter, and can't wait to style it fro spring/summer as well! haha, i know right!? 10 years ago is was a no-no to mix metals, brown & black, and denim on denim! exactly - still not sure about light denim on light denim... thank you for your comment! yes, I agree totally! not about the trend, but all about how you rock what you wear everyday! thank you for your comment. I enjoyed finding your blog from the IT list, and can't wait to read more! thank you! this necklace is huge, but someone it goes with everything I pair it with. i love denim on denim and you rocked it well! your necklace is great, by the way. Love this outfit! That necklace is a knockout.